The Purpose Driven Life is a ball of confusion, full of contradictions and lies that will lead one to, or keep one in, a life of hell (though it may “feel” right, death follows). It is a proposal for a program of religious self-righteous works that destroys, not fulfills. In this writing I will show that the author does not personally know the Lord Jesus Christ, but rather preaches a system of works based on a man-made version of Christ construed from his own knowledge, which is neither godly nor good. Whether you have red the book or not, this paper will be instructive in the teachings of the true God and Lord Jesus Christ and His ways, as contrasted with the misrepresentations of Him found in this book. Since some of these errors are addressed in specific writings on our website, I provide links to the applicable writings in an appendix at the end. Error #1) You can receive Jesus Christ by reciting a prayer, a decision God is waiting, and depending, on you to make. Error #2) You are born of God when you do this. Error #3) After “receiving” Christ, it is up to you to follow a program of self-development, with which the bulk of this book is meant to provide you. Error #4) Unless you receive Christ in this manner, in this lifetime, you will spend eternity in hell. Error #5) The Bible, as final authority, teaches all these things. The Purpose Driven Life teaches you to be a Christian by raising yourself up by your own bootstraps. It is do-it-yourself Christianity, full of dos and don’ts that put the onus on you, the reader, to make yourself acceptable to God, and of useful service to Him, based on a corrupt and humanly conceived image of God. Built on a false foundation, these measures must and will fail, leaving you with loss and no hope at the end of the day. Worse yet, others suffer when you play God, as this book teaches you to do. It is because of the kinds of activities promoted in the book that destruction runs rampant on earth. According to the Bible, man’s self-righteous and religious works are responsible for all the bloodshed on earth since Cain and Abel. Such works cover over and hide the sins of men, rather than exposing and dealing with them. The things to which this book proposes to lead you, peace and life abundant, are the very things it blocks and denies you. If we were to ask for a brief synopsis of the most prevalent of the false gospels of Christ in circulation today, this is it. Must God “invite” one to fulfill the purposes for which He made them? Is that what He did with Saul of Tarsus? If He made one for a purpose, will He not fulfill that purpose? “And He said to them, To you it is given to know the mystery of the Kingdom of God. But to those outside, all these things are given in parables so that seeing they may see, and not perceive; and hearing they may hear, and not understand; lest at any time they should be converted, and their sins should be forgiven them” (Mark 4:11-12). Desperate and lying men are known to promise anything to close the deal, whereas God, Who is the very opposite (He is the Truth, and in control), does not need a man to do anything for Him. Why? Because He can, will, and must do it all. He does not entrust anything to men. The only possibility of intimacy with Him is by His initiation. “No man can come unto Me unless the Father draws him.” It is His doing to take a person through the process of salvation whereby that person becomes one with Him, and then does His works. And the first words of introduction are not a plea to accept Him, but a call to repent and turn away from one’s own thoughts and ways, with a warning about the costs of following Him. “And it happened as they were going in the way, one said to Him, Lord, I will follow You wherever You go. And Jesus said to him, Foxes have holes, and birds of the air have nests, but the Son of Man has nowhere to lay His head” (Luke 9:57-58). “If anyone comes to Me and does not hate his father and mother and wife and children and brothers and sisters, yes, and his own life also, he cannot be My disciple” (Luke 14:26). “But he that shall endure unto the end, the same shall be saved” (Matthew 24:13). Warren’s invitation and prayer have nothing to do with the Lord Jesus Christ. Instead, unbeknownst though it may be to him, they are the words of a deceiving angel of light. It is “the thief, who does not come except to steal and to kill and to destroy” (John 10:10) that is presented here. It is a false Jesus and false gospel that serves the prince of this world, who will allow you to be as religious as you please, but will never preach repentance from self and sins and the crucifixion of the flesh by the cross. You can and will get to keep your miserable life, while appeasing your conscience for a time. But make no mistake, you will remain in condemnation, and that makes it doubly worse, because deceived into thinking you have something that you do not. That is why so many churches that believe and follow the gospel that Warren is preaching have members suffering from diseases, accidents, and so many other tragedies. It is not the “attack” of Satan. Those are the rewards of his fellowship. It is not the favor of Jesus Christ, Who is in full control and does all things, but is indicative of His wrath that comes on those who take His Name in vain, which means they profess to follow Him, but do not. Those suffering in churches are taught to blame Satan for what God does to them, and to credit God for what Satan has given them, a religious justification to feed themselves on the things of this world. Not so. In the first place, such a prayer does not mean a person has truly repented and turned to God. And without repentance, a person is still in his or her sins, despite appearances. A person still in his or her sins cannot be born of God. “Everyone who has been born of God does not commit sin, because His seed remains in him, and he cannot sin, because he has been born of God” (1 John 3:9). Many are the false conversions that accompany these “simple” prayers that Warren and so many others teach and urge people to confess. This is not to say that there are not simple prayers heard by God, because if in faith, God does hear. He knows and acknowledges the heart, not the words or formulas men concoct. Being induced to pray by emotional appeal and reasoning is not of faith and does not amount to anything. “You have not chosen Me, but I have chosen you and ordained you that you should go and bring forth fruit, and that your fruit should remain; that whatever you shall ask of the Father in My name, He may give it to you” (John 15:16). Overlooked is the crucial fact that the Lord specifically invited whom He willed, at the ordained time He invited them (Matt. 4:19, 9:9), and they responded to Him. Warren behaves as if, and is teaching people that, they are in the driver’s seat, making the decision to follow Christ whenever they want, becoming a child of God by the will of the flesh and of man. However, discipleship is only possible by His will, His calling, His drawing, His choosing and timing. “And no man takes this honor to himself, but he who is called of God, as Aaron was” (Hebrews 5:4). “But as it is written, ‘Eye has not seen, nor ear heard,’ nor has it entered into the heart of man, ‘the things which God has prepared for those who love Him.’ But God has revealed them to us by His Spirit; for the Spirit searches all things, yea, the deep things of God” (1 Corinthians 2:9-10). However, while one has the peace that passes understanding in Christ, and can always come to God in time of need, and be in prayer and thanksgiving always, this is not the same as the “easy access” Warren says is promised. It is not an automatic and casual relationship one might have with God, as he implies. The flesh must die and will never have access, let alone easy access, to God. The point I wish to make here is that Warren is promising these things to the unregenerate and carnal man. He is speaking as if “faith in Jesus” is something you can find within yourself and exercise at will to be saved. That is not true, yet many are deceived by this erroneous gospel. “For by grace you are saved through faith, and that not of yourselves, it is the gift of God” (Ephesians 2:8). It is not your faith that can save you, it is the faith of Christ that does. “…and the righteousness of God is through the faith of Jesus Christ to all, and upon all those believing…” (Romans 3:22 YLT). The promises of God are all “yes” in Christ. They are not “yes” to the natural and fallen man. Warren does not mention any cost or what is truly required for one to receive and enter into the Kingdom of Heaven. He speaks of the natural man assuming the benefits and privileges automatically. There is no mention of confession of sins, or repentance, which must always come first. There is no mention of the cross, which Jesus said we would need to take up if we are to follow Him and be His disciples, how much more to be His brethren, and have life in Him. “And whoever does not bear his cross and come after Me, he cannot be My disciple. For which of you, intending to build a tower, does not sit down first and count the cost, whether he may have enough to finish it; lest perhaps, after he has laid the foundation and is not able to finish, all those seeing begin to mock him, saying, This man began to build and was not able to finish. Or what king, going to make war against another king, does not first sit down and consult whether he is able with ten thousand to meet him who comes against him with twenty thousand? Or else, while the other is still a great way off, he sends a delegation and asks conditions of peace. So then, every one of you who does not forsake all his possessions, he cannot be My disciple” (Luke 14:27-33). According to Warren, if you make a certain statement, that is faith, and you have become born again. All that has really transpired, however, is mental assent to something desirable. You have been shown a picture of a house, asked you if you liked it, and when you said you did, were told you that you own it. The problem is, the one showing the picture does not have the deed to the house, is not even a realtor, nor does he represent the true owner. Another way I can put it is that the man on the street corner trying to sell you an imitation Rolex will not talk about the extraordinary cost of the real thing, but will instead focus on the cheap price of the fake one (which you can now afford). “And Jesus answered and said, Truly I say to you, There is no man that has left house or brothers or sisters or father or mother or wife or children or lands for my sake and the gospel’s sake, but he shall receive a hundredfold now in this time, houses and brothers and sisters and mothers and children and lands with persecutions, and in the world to come, eternal life” (Mark 10:29-30). “Confirming the souls of the disciples, exhorting to continue in the faith, and that through many afflictions we must enter into the Kingdom of God” (Acts 14:22 LITV). The notion or doctrine that salvation in Christ is free is a lie. While one “comes and buys without money,” one does buy. It will cost you everything you have and are. Money cannot buy the Kingdom of Heaven, but it will cost all your money and everything else. You cannot serve God and mammon. The Purpose Driven Life can present all promise with no price, because its author, Warren, has never paid the price himself and does not have the promised goods. He has nothing to do with the fellowship of the saints, nor will you if you follow his teachings. He can only present a facsimile of Heaven that exists in his imagination. What he presents is bogus. People, believing themselves to be in the favor of God, justify themselves in all kinds of evils (some subtle and hidden) in the sight of God. Mankind is naturally prone to evil; how much easier to justify evil with God on your side! That is how the Son of God came to be crucified. In following this false gospel, you can give an appearance of godliness, but you will be devoid of Christ’s life and power. You can pay lip service to His laws, but without obedience to His personal and general commandments, you will be taking His Name in vain. You may think to do well, but your evil spreads out like a cancer, starting with your homes, to your businesses, communities, governments, and onto the whole world. Rather than bringing life to the world, you bring death. All are perishing and do not know how it is happening, or why. On the other hand, God has brought us into His presence, the only place of true peace and goodness. He has granted us repentance by faith, and has given us His Spirit within to cause us to lay down our lives, as is pleasing to God and useful to man, speaking the truth that makes free. This is life. He sends us to teach others the right way, which He has shown us and proven in our lives, a way of judgment and obedience. We preach that others might enter life too, that the world may be blessed. There are only two sides, and if you are not on one, you are on the other. “He who is not with Me is against Me, and he who does not gather with Me scatters” (Luke 11:23). There is no shortcut to Heaven. Though popular to proclaim one, it is untruthful, unreal, and nothing less than robbery. Both God and the souls that buy into and follow the lie are robbed (not that they are not also responsible for receiving stolen goods; they that partake are offenders as well). Warren is not building on the only Rock and Foundation that has been laid, but on the sand of human ability and power to emulate God. All subsequent teachings in his book are built on this false foundation, promoting the works of men, the paths of the destroyer. “Concerning the works of men, by the Words of Your lips, I am kept from the paths of the destroyer” (Psalms 17:4). Starting off with this false Christ, which is disconnected from the life and power of the Real, Warren loads the reader with a hodge-podge of vain works in a doomed effort to realize the character of God. Just how are you supposed to let God use you? Is God dependent on us for permission to do as He (capital “H”, not lowercase, as is befitting the Real God) pleases? Isn’t this presumptuous? Does clay “let” the potter mold it? Deciding to “let” God use you is self-righteous, and is the very thing Warren accurately says is doomed to failure – using God for self-actualization. Yet, as we shall see, while Warren is telling you to let God do it, he is also loading you down with more impossible tasks in order to accomplish it yourself. Which is it? Will God do it, or are you going to have to do it yourself? The issue is never resolved throughout the book, leaving the reader neither here nor there. It is a hellish burden, without a vision, goal, rest or respite. Just who is the man or woman that can give God the full glory He deserves? There is a way to give God glory, but Warren does not know or teach it. Instead, he presses himself and others into acts of the flesh that he thinks are giving glory to God. The burden is on the sinner to glorify God in his or her own goodness. You may as well be told you should be defecating perfectly wholesome and edible meals. Offering God your righteous acts to give Him glory is no less delusional and disgusting. “Call on Me in the day of trouble; and I will deliver you, and you shall glorify Me” (Psalms 50:15). This is the legacy of eating from the Tree of Knowledge. Your eyes are opened to be as God, knowing good and evil, and now assuming the driver’s seat, while yet in conflict with God, you choose to be what you desire based on your knowledge. The only problem is that you do not have the life of God outside of Him to know what to do with your knowledge. So instead of life, it brings death, just as He forewarned it would. No, we cannot be anything we choose, whether for good or for evil. We are what God makes us. That does not excuse anyone from the God-given responsibilities that come with what He gives you. “To whom much is given, much will be required.” But Warren is once again placing the burden of being and doing on man, not acknowledging the Alpha and Omega, the Beginning and the End, the One Who initiates and completes. “And in very deed for this cause have I raised you up, for to show in you My power, and that My name may be declared throughout all the earth” (Exodus 9:16). Is it not good to know He is running the show? It is rest for the weary. “But by the grace of God I am what I am, and His grace which was toward me has not been without fruit, but I labored more abundantly than all of them; yet not I, but the grace of God with me” (1 Corinthians 15:10). “For this one is a chosen vessel to Me, to bear My name before nations and kings and the sons of Israel. For I will show him what great things he must suffer for My name’s sake” (Acts 9:15-16). “But when it pleased God, Who separated me from my mother’s womb, and called me by His grace…” (Galatians 1:15). Warren puts man on a pedestal for the same reason all men do – they trust in themselves and their own righteousness. This is the mindset that spawns all man-centered religious organizations and works. Is it not good to know instead that it is not by our will, or by our running, but by God Who shows mercy (Romans 9:16)? Who is God Almighty, the Creator, to be likened to, your celestial good buddy? Is His just like any friendship? What friendships require you to forsake all that you have, and to love your friend with all your heart, mind, and soul? In which friendships do you live 24/7, being required to do everything that your friend asks of you? In what friendships are you dependent on your friend for everything, even the grace to be his or her friend as described? This is plain and simple nonsense, making God into man’s image and loading impossible burdens on those being fed what seem to be innocent platitudes but are not. Lies kill. “Abide in Me, and I in you. As the branch cannot bear fruit of itself unless it remains in the vine, so neither can you unless you abide in Me. I am the Vine, you are the branches. He who abides in Me, and I in him, the same brings forth much fruit; for without Me you can do nothing” (John 15:4-5). Is this not an amazing thing? Earthly parents of dubious ability can bring up a child to be toilet trained, but omnipotent God cannot. Warren is talking about “Christians” by his own definition, not true Christians. Are there Christians out there who are hurting, and need help? Yes. Stop accepting false burdens and following men, all of you that hear my words. Turn to Him Who will lead you in the way of life and restoration. Who is He? He Who illuminates. Follow us as we follow Christ. The churches of men are not dying. They are dead, and always have been. The service Warren is soliciting is not the works of faith, but of the flesh. Are any of His people wearying themselves in these fires? Come out from among them, as He commands, and He will be as a Father to you, and you shall then be His sons and daughters. Is smiling what it is all about? Those who have the love of God do His will despite how they feel, or how they appear to men. Inside, we have the peace of God that passes understanding. Truly, it is not about having long faces, but this talk of doing the will of God with a smile is more self-righteousness and works of the flesh; it is religious unreality. Who is sufficient to all these things? What are the works of God that He requires? The pressure once again is on you to perform, and this time it is for all the marbles. Although Warren does not get into more detail, spending “eternity apart from God forever” means “burning in hell, time without end.” Did you need a little motivation to “accept” Jesus? How about a lot? Here it is. I do not know of a more damnable lie. Things do not work this way at all. It portrays God as horribly grotesque, impugning His Character to be far more perverse than that of the most ignoble tyrants of history. Here is a supposedly loving God, Who creates beings in His image, His own offspring who are dependent on His mercy and provision by His infinite power and wisdom, yet He consigns them to eternal torment because they do not “accept” Him? People, this thought is not in the Bible whatsoever, as men have presumed or have imagined it to be. It is man’s expression of his own frustration and an unquenchable, bloodthirsty desire for vengeance, used as a tool to control others. We have much more to say about this matter in several writings linked in the index. For now I will point out how this blasphemous slander has affected Rick Warren, being a major factor in spawning his religious works and this very book. That was not faith coming from Rick’s father. It was the torment of hell. Let me ask you a question, dear reader: If you truly believe, or are trying to believe, that every soul that has not “accepted” Jesus Christ as Lord and Savior is going to hell, where they will burn forever, is it not your most solemn duty to give up any and everything in life to make every possible effort to abort that ending for as many souls as possible? Should you be doing anything other than the very basics to maintain your health, so that you may spend every conceivable resource and the very last ounce of your strength to the end of saving souls from eternal hell fire? Men will make great efforts to rescue those suffering shipwreck, plane wrecks, hurricanes, tidal waves, and so on. They make great efforts to save beached whales, endangered species, even cats in a tree (as though cats can’t find their own way down). We see it every day on the news, if we are not living it ourselves. How much more should you, as a professing Christian, and as one supposedly filled with the love of God, be doing to save souls from eternal torment? If the unbelieving are willing to expend so much energy on the temporal that will soon be gone, how much more should you be doing for the eternal, where one million years from now that soul that did not “accept” Jesus will still be in agonizing darkness, burning in the lake of fire, with no reprieve in sight, ever? Rick’s father was not crying for the souls of men. He was tormented by his conscience condemning him for not doing nearly enough when he had the time and energy to do it. You can never, ever, ever do enough if you believe these lies. If you have not served God acceptably according to your conscience (and who could, given the circumstances I have just described? ), then where do you stand? “For if our heart condemn us, God is greater than our heart, and knows all things” (1 John 3:20). Rick’s father was not yet saved himself, or delivered from the condemnation of his own works. If he had been he would have died in peace, as the saints of God do, and not in torment. He also would not be dying of cancer. What, does God afflict his servants with diseases wherein their own bodies attack them? He promises that these things will not happen to those that obey Him (Exodus 15:26). Either He is a liar and impotent, or this man was not following Him. What choice does one have, but to go with the latter? We know that God is true, and so we believe Him, as it is written: “Let God be true, and every man a liar” (Romans 3:4). Rick was given his life’s mission through an unbelieving man’s desperate and moving plea, the man that naturally would have the most profound influence on his life, his beloved father, who laid hands on him to send him out to “save one more for Jesus.” Only this “Jesus” is not the risen and ruling Lord and Savior; he is a different one, one who needs you to “accept” him or he will unfortunately have to roast you, while his small entourage that was willing to receive him experiences bliss with him forever in the afterlife. Somehow having family members and other loved ones burning in hell will no longer be a concern in the next realm (though for many professing Christ it is not such a concern now; does that not tell you something?). The suffering of others, it is assumed, will no longer bother those of us who are righteous enough to believe. How hard is the heart of man to believe such lies! While men are capricious and capable of any atrocity, God does not change. He never ceases to care, to be working all things for good, His dominion over all realms. “Though I make my bed in hell,” David, a man after His own heart wrote, “behold, You are there” (Psalm 139:8). God does not change the hearts of men by the threat of hell. That is not love; it is extortion. If the Son of God died for us when we were already estranged from God, to reconcile us to Himself, has He therefore failed forever? The devil would have you believe it, and many do believe it. The truth is that God does not fail. Love never fails. In due time every eye shall see Him, and every knee shall bow, and every tongue shall confess that He is Lord, to the glory of God. Knowing there is a but a short time to save souls, Warren presents some pitifully trifling things you should do, which amount to trying to melt a glacier with a candle. This makes the burden of it all the more unbearable to anyone who cares. The truth is, however, that men are exposed by this doctrine as being uncaring and hard hearted about the fate of others. The works produced by believing the doctrine of eternal torment, rather than coming from a true knowledge and love of God, are a palliative to salve the conscience. They are undertaken to alleviate the condemnation that comes from living a selfish life and not doing enough to “save” lost souls. Without faith and the love of God, even if a man were to give his body to be burned it would not be enough. Men’s works cannot bring the peace or salvation of God (remember Rick’s dad). Warren is saying that if you do not reach the unbelievers, their eternal blood is on your hands, because God loved them to the point of paying the price for them with His very life in the Son, and you failed to reach them for Him. You did not give or do enough. How can you live with yourselves? Who can ever justifiably say, “I have done enough”? Error #5) The Bible, as the final authority, teaches all these things. Substituting the Bible for God, and worshiping the Book rather than the Author, has led to many errors that have been preached as gospel truth. The Purpose Driven Life is a book born of setting the Bible up as God, enthroning personal interpretation and religious practices based on what a man conceives God to be in his own mind (and to suit his own purposes), and using the Bible as justification to do so. While Warren promotes the Bible as the ultimate source of authority, he does not know or understand what it teaches because he does not know or understand the Author, Who is the Ultimate Authority. Yes, there is an alternative to speculation and opinion, and indeed it is revelation. But by saying you can “turn to what God has revealed…in his Word,” Warren means that you should consult with the Bible. Now, there is nothing wrong with consulting with the Bible. It is the inspired Record of God. But the Bible is not God. It does not give revelation. Only God can do that. Jesus Christ is the Word of God to Whom we must turn. Peter received this from God. “Jesus answered and said to him, You are blessed, Simon, son of Jonah, for flesh and blood did not reveal it to you, but My Father in Heaven” (Matthew 16:17). “You search the Scriptures, for in them you think you have eternal life. And they are the ones witnessing of Me, and you will not come to Me that you might have life” (John 5:39-40). “But until this day, when Moses is read, the veil is on their heart. But whenever it turns to the Lord, the veil shall be taken away” (2 Corinthians 3:15-16). The Bible, you can be assured, does none of these things. If it did the multitudes reading and praising it would have the things Warren attributes to it. There were many lepers in Israel (where the Bible readers were) in the days of Elisha, but only a stranger, Naaman the Syrian, was healed. Warren has not had communion with the One Who does all those things. If he did, he would not be crediting the Bible. “I know that you are Abraham’s seed, but you seek to kill Me because My Word has no place in you. I speak what I have seen with My Father, and you, then, do what you have seen with your father” (John 8:37-38). When God drew me to Christ, and gave me faith in Him, I did not need to pull myself up by the bootstraps to believe the Bible was truth. He opened my eyes to see that, and to receive the truth contained therein. He decided on what to reveal, when to reveal it, and how. He was and is the final Authority. And when I fell in sin, He sent a man of God to tell me my specific sin. The Bible did not tell me that, though the testimony was there when I received the truth. It is easy to submit to a book without understanding or conviction of sin, harder to submit to a man speaking from God that calls on us to forsake our idols. Indeed, it is impossible for men to have the humility to receive and submit to Christ coming in the flesh, but with God all things are possible. Faith is His doing and His gift. To see God’s “final authority” as coming only through reading the Bible is severely restricted, and ultimately serves each person in doing what is right in his or her own eyes, “according to the Bible.” It makes an idol of the Bible as each person interprets it according to his or her corrupt sight. Only one set on his or her own thing will worship an idol, be it the Bible or any other thing. People worship idols because they serve themselves, not God. 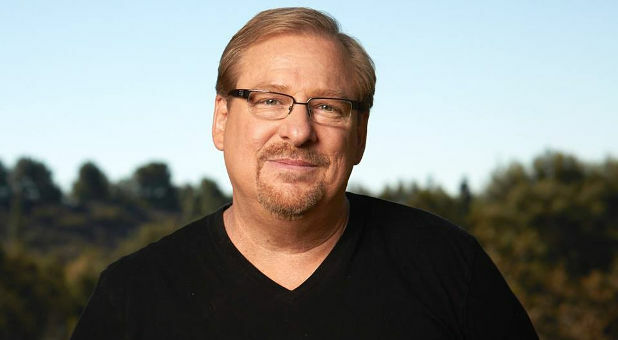 Rick Warren is not serving God. He serves himself, and needs to repent. “Whoever partakes of My flesh and drinks My blood has eternal life, and I will raise him up at the last day” (John 6:54). “And this is life eternal, that they might know You, the only true God, and Jesus Christ Whom You have sent” (John 17:2-3). “And no one has ascended up to Heaven except He Who came down from Heaven, the Son of Man Who is in Heaven” (John 3:13). “And if I go and prepare a place for you, I will come again and receive you to Myself, so that where I am, you may be also… Yet a little while and the world does not see Me any more. But you see Me. Because I live, you shall live also. At that day you shall know that I am in My Father, and you in Me, and I in you” (John 14:13,19-20). “The fear of the LORD is the beginning of wisdom: a good understanding have all they that do His commandments; His praise endures for ever” (Psalms 111:10). Who is it that does not need wisdom (and therefore the fear of God), in any age or at any time? When is a good time not to keep His commandments? Why should His praise be silenced? And what does the Bible say of the one man, Abraham, who in particular is described as the friend of God (James 2:23)? “And He said, Do not lay your hand on the lad, nor do anything to him. For now I know that you fear God, since you have not withheld your son, your only one, from Me” (Genesis 22:12). And to whom is the Word of salvation sent today? “Men, brothers, sons of the race of Abraham, and whoever among you fears God, the Word of this salvation is sent to you” (Acts 13:26). Only those who fear God are His friends. His fear is not the kind that men exert on one another, but is the kind they do not know, especially in this day where every man sits on the throne of his own opinion. The fear of God is reverence of the highest order. Those who lack it have not seen or known Him whatsoever. “Therefore, since we are receiving a Kingdom that cannot be shaken, let us have grace, by which we may serve God acceptably with reverence and godly fear, for also, ‘Our God is a consuming fire'” (Hebrews 12:28-29). “For My thoughts are not your thoughts, neither are your ways My ways, says the LORD. For as the heavens are higher than the earth, so are My ways higher than your ways, and My thoughts than your thoughts” (Isaiah 55:8-9). “The God who made the world and all things in it, since He is Lord of Heaven and earth, does not dwell in temples made with hands, nor is served with men’s hands, as though He needed anything, since He gives life and breath and all things to all. And He has made all nations of men of one blood to dwell on all the face of the earth, ordaining fore-appointed seasons and boundaries of their dwelling, to seek the Lord, if perhaps they might feel after Him and find Him, though indeed He is not far from each one of us. For in Him we live and move and have our being, as also certain of your own poets have said, For we are also His offspring” (Acts 17:24-28). “If He sets His heart on man, if He gathers to Himself his spirit and his breath, all flesh shall perish together, and man shall turn again to dust” (Job 34:14-15). But Warren does have it right that God planned everything including the details in every life so that all would come to know Him. Now it yet remains for Rick to enter into the reality, according to the will of God. The only way to become like Christ is to be born of His Spirit. That which is born of something grows up to become that same thing. The true and mystical Church of God is His body. Jesus said: “But when you pray, do not babble vain words, as the nations. For they think that in their much speaking they shall be heard. Therefore do not be like them, for your Father knows what things you have need of, before you ask Him” (Matthew 6:7-8). Rick is not preaching the works of faith, but faith in works of the flesh. Flee fornication! He is teaching you to commit adultery with another god, in the Name of Christ. “I am Jehovah, and there is none else, no God besides Me; I clothed you, though you have not known Me; that they may know from the rising of the sun, and to the sunset, that there is none besides Me. I am Jehovah, and there is none else; forming the light and creating darkness; making peace and creating evil. I Jehovah do all these things” (Isaiah 45:5-7). That means that you cannot attribute the evil in your life as something coming from autonomous evil men and spirits, “filtered” by God for your good, but rather as coming from God Who does these things through whatever agents serve Him in that capacity. You may be suffering from the fruits of your doings, that yes, serve for good, but which are there as a present rebuke and destruction from God because of evil. This I know: Only by the mercy of God will one receive correction and repent. Warren does not acknowledge the need for repentance and the cross. He is a savior of the flesh, serving in the “Christian” religion of Satan, who is disposed to, and entertains, the things of the flesh. If a man does not acknowledge and receive rebuke for evil, how much less will he receive the cross? The example and teaching that Warren gives is evil. David did no such thing, nor is the Book of Psalms “full of ranting, raving, doubts, fears, [and] resentments.” Not in the least. The carnal man may see this, but the spiritual man will not, because it is not what the Spirit is saying or doing through the Psalmists. How long will you people consult with the dead in the Name of the Living? How long will you heed presumptuous sorcerers, prophets of Baal and Ashtoreth? This is that false Jesus we have been identifying from the beginning, whom Warren preaches and many others depict as well. While the Son of Man was not a slacker, neither did He come as a servant to men as Warren portrays Him. He was not a social worker. He was not a do-gooder. He was not a bleeding heart Hallmark card icon with long hair and a faraway gaze. He was not an insecure religious person that worked hard at trying to fulfill the many “to do’s” in The Purpose Driven Life. He was none of those things, or anything that men can and do conceive of as lovely and desirable. Why is that? Because He came not to serve man, as men do, but to serve God in the laying down of His life. That is the real Jesus Christ, Whom no man knows. “Then Jesus said to them, When you have lifted up the Son of Man, then you shall know that I AM, and that I do nothing of Myself, but as My Father has taught Me, I speak these things. And He Who sent Me is with Me. The Father has not left Me alone, for I always do those things which please Him” (John 8:28-29). Jesus Christ looked neither to the left nor the right, but lived with singleness of mind and purpose to love God with all His heart, mind, and soul. He laid down His life according to the commandment of God given to Him. And in so doing He served mankind by becoming Lord and Christ, the Savior of all men. “Let this mind be in you, which was also in Christ Jesus: Who, being in the form of God, thought it not robbery to be equal with God, but made Himself of no reputation, and took upon Him the form of a servant, and was made in the likeness of men. And being found in fashion as a man, He humbled Himself, and became obedient unto death, even the death of the cross” (Philippians 2:5-8). If we follow Him, we will know Him. If we know Him, we will become like Him, and neither will men know or recognize us, just as they do not recognize Him. “He who has an ear, let him hear what the Spirit says to the churches. To him who overcomes I will give to eat of the hidden manna, and will give to him a white stone, and in the stone a new name written, which no man knows except he who receives it” (Revelation 2:17).